Egyptian cotton satin, luxury range of bedding. 100% Egyptian cotton with a satin finish. Based on years of experience, only the best quality Egyptian cotton is selected by our factory in Portugal. Available in 500 and 300 thread count for a warm, soft and hard wearing range of bedding. Made from 100% Egyptian cotton, our range of fitted sheets are a very high quality. The natural fibres are the key to guaranteeing a softness and unsurpassed comfort at bedtime. The touch and feel of these elegant Egyptian cotton fitted sheets is available in either a 300 thread count such as the Lisbon Egyptian cotton fitted sheet. 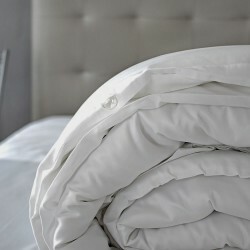 Or the luxury 500 thread count Provence Egyptian cotton fitted sheet. The corners of all the Egyptian cotton fitted sheets are elasticated to allow for a perfect fit over your mattress, as well as facilitating an easy change when making your bed. Select the correct fitted sheet size from a choice of single, double, king and super king for your mattress. The depth of all our fitted elasticated sheets is a convenient 28cm. The high quality 300 and 500 thread count elastic corners fitted sheets are supplied in an attractive pure white colour which blends perfectly with any bedroom décor. Pillowcases made from the highest quality cotton available, namely Egyptian cotton. Renowned worldwide for it’s softness and durability, the long fibres of the pillowcases made from Egyptian cotton last for many years. Our range of 300 thread count Egyptian cotton pillowcases are made in Portugal with 300 threads of cotton per square inch. This high density thread count is what makes the pillowcases so soft and smooth to the touch. The 300 thread count Egyptian cotton pillowcases available across our range of luxury bedding are packed in sets of two, both the Classic and the Oxford style. The Classic pillowcases fit snuggly over standard pillows and measure 50cm x 75cm. The Oxford pillowcases are the same size but with an additional 5cm decorative flap or border around each edge. The Classic Egyptian cotton pillowcases with a 300 thread count are all pure white and without any decorative edges. The Oxford pillowcases manufactured from Egyptian cotton are designed to match the specific range and have the same embroidered edging, such as the Harmony Oxford pillowcases. The Connie Home 500 thread count Egyptian cotton pillowcases are extremely soft and breathable, the ideal combination to allow you stay fresh and sleep soundly. The high quality pillow cases with such a high thread count are perfect for a relaxing night’s sleep. Made from 100% natural Egyptian cotton, which is considered to be the best fabric in the world, and is the number one choice amongst luxury bedding manufacturers. The soft, silky feel and luxurious look of our 500 thread count Egyptian cotton pillowcases is appropriate for the most sophisticated bedrooms. These luxury pillowcases made from Egyptian cotton are supplied in sets of two and both the Classic and the Oxford pillowcases measure 50cm x 75cm. In addition the Oxford pillowcase has a decorative 5cm border around each edge. The Classic Egyptian cotton traditional pillowcase is available in a simple pure white colour without any embroidered edging. 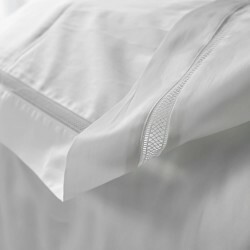 The Provence 500 thread count Oxford pillowcase has an attractive pure white 5cm border. The ability of our flat sheets to stand out from the crowd is all down to the softness and comfort they provide. This soft feel creates a wonderful fresh sensation at night time, this comes from the use of quality textiles, namely Egyptian cotton. Made from 100% natural fibres of Egyptian cotton, a material which is noted for it’s durability over time as well as it’s soft touch. With our collections centred around a pure white look, creating a sense of elegance and sophistication to your bedroom. Such as the Lisbon 300 thread count flat sheets. Some of the Connie Home range of luxury Egyptian cotton flat sheets have a border along the upper edge to create an elegant, innovative effect. Whilst others maintain the simple classic design which generates a natural feel to your bedding. Available across a wide selection of sizes from single, double, king and super king, depending on your mattress size. There’s nothing better than having high quality bed linen on your bed. For that reason Connie Home provide a range of 300 thread count Egyptian cotton duvet covers. These duvet covers are exquisitely soft and adapt to all skin types, the softness is derived from the fact that the Egyptian cotton contains 300 threads per square inch. The elegant collections have duvet covers available in a range of sizes, single, double, king and super king depending on your mattress size. Within our collections we have duvet covers in the Victoria, Harmony and Lisbon ranges, all of which have a button closure method at one end to allow the duvet filling to adjust perfectly to the duvet cover. Without a doubt these elegant duvet covers will give your bedroom a really elegant look as though it’s straight out of a style magazine.